Dry needling is typically used to treat trigger points. Disuse, or repetitive postures with a muscle in a shortened or lengthened position can cause trigger points. Trigger points may also develop due to arthritis. As trigger points develop they can be a very significant source of pain and loss of function. Studies have shown that when stimulated with a dry needle these trigger points will create a twitch response and release the sustained contraction. This results in increased mobility and decreased pain. 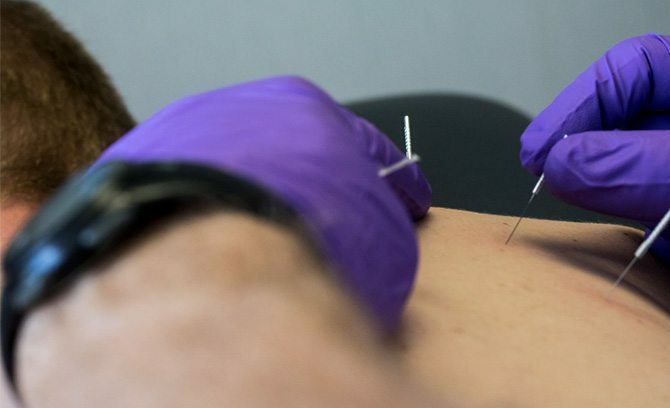 Dry needling, especially in conjunction with exercise, can be an effective treatment of pain, loss of mobility, and improvement of function and performance. Dry needling is now offered as a treatment at our clinics.